Leaf Eatery focuses on the balance of nutritious and delicious. Yes, it is possible. The founders, Karla and Zheni, pride themselves in using local, fresh, and organic ingredients while adding flavorful components from all over the world. Grab a cilantro tuna bowl on your way into the office next time! If you find yourself craving a heaping plate of tacos, look no further than La Lupe. 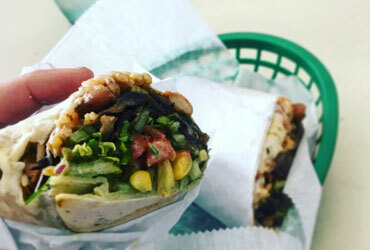 With nine different taco fillings to choose from, you won’t be disappointed. But you will be full, because chances are, you won’t be able to narrow down your choices. As long as you still have room for Elote, Mexican grilled corn that’s been dosed in mayo, cheese, and chili powder. Also don’t worry if you feel too full to head back into Prosper to finish working, it’s only .2 miles away so you can practically roll there. Lastly, if you’re looking to wind down after a stressful day, Bodeguita is the place to do just that. Bodeguita, translating to little cornerstore, blends Cuban flavors, live music, and island times. The essence of the old Havana, as they say. They set themselves apart with a vintage prohibition feel, while being really cozy and remaining inviting. Sip on a CBD infused cocktail to relax yourself into the weekend, or nibble on some yellow plantains while swaying to some Cuban tunes. There’s nothing we love more than the support of everyone in our community, so we’re thrilled to collaborate with these incredible, special places and hope you are too! We’ll see you there next time!